If you want a really popular Disney character, like Mickey or Stitch or something, there are machines all over the place with various goods, though. Recently, these are all over... They look like blow-up dolls, don't they?!?!?! WTF, these are hideous, who would ever want one?! Not just hideous, they're SCARY. I MEAN, NO. JUST NO. But they must sell well, because they (and the same design, but other non-Disney characters) are ALL OVER. Other than that, I just like things here and there.. ^-^ How about you guys? I probably watched My Neighbor Totoro a thousand times with my grandson when he was little. I love Totoro and the cat bus and I actually got some small versions of them in plastic online. Before that, when I was little I loved a Japanese print of a fox wearing a cabbage leaf for a hat (which I still have) and the fox spirits in Hiroshige's (?) prints. I love reading about your life. Glad the writing is going, even if it is hard. I'm planning to do NaNoWriMo and PiBoIdMo. National novel writing month and picture book idea month. I'm trying to become a children's book writer. Ooh, Nanowrimo! I never had the guts to try doing that. ^^; People that finish are amazing! Y'know which ones I love but are also creepy? The little dog-beans (inumame? Maybe...). The commercials have someone eating some sort of bean, and one of them turns into a little puppy that, while odd mood-music plays, tells them trivia. Then that person loses their appetite. = P They're so strange! I have a pencil case with them on it. I've still got a Sailor Mars UFO catcher a friend got for me from when she visited Korea (she's adopted, and that's where she's from). It's currently packed away in a box (no where to put it) but I've still got it. Is it just me or are the not as popular San-x characters always the most original/fun? At least Tsugi no hi Kerori is somewhat major online Sabo-kappa etc. I think Sabo-kappa is San-x: http://www.san-x.co.jp/newcha/2009/new332.html Just so you don't waste your time looking for it at a Sanrio shop. Huh? Isn't San-x the same as Sanrio? They have the exact same font in the logo. Nope they are completely different companies. When I first got into their stuff I thought it was the same too. Mamagoma is still love for me! Though I like the nyanko and the black kitty with white mittens too! I'm loving sock monkeys these days. Just get a load of this dude! 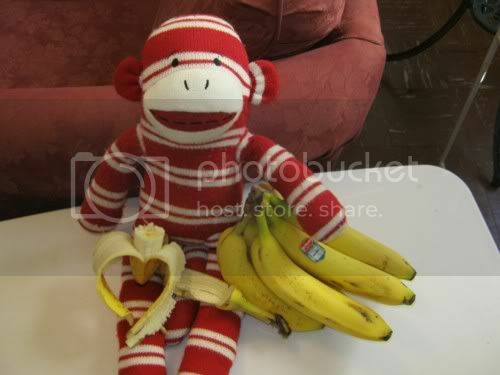 Any sock monkeys in Japan? It doesn't seem to be popular here, but I've seen them a few times here and there. That scary-face Mickey I'm pretty sure is a crossover with a japanese show called 'the world of golden eggs' where everyone has faces like that. It's a really weird show but it's really popular, so I'm surprised you don't know it. Do a goole image search for 'world of golden eggs' , there are also clips on youtube. Ahhh UFO catchers. So addictive. I found one in Ueno with Nodame Cantabile goods still in it T_T I was so happy 'cuz I *love* Nodame but for the life of me I couldn't get any of them! I am very much impressed by Sanrio's marketing capabilities. I keep saying that Hello Kitty is older than I am, so it's Hello Kat now, and yet, she's still so popular. I read in Chinese paper the other day that this year it'll be very very cold. I don't remember the reason though. Anyway, take care! Those disney UFOs have to be the ugliest things I have ever seen. Who would want to wake up with one of those staring you in the face? Hello, my name is Carey. Arthurfrdent is friends with me, and knows I have ITP, and he really likes your art, and noticed that you have ITP as well, and asked if I could offer my advice or any information you'd like about ITP. I'm really glad that steroids are working for you; I hope you didn't get moon face. Then you'd be too much kawaii! I don't wish to impose, because I know that ITP is pretty scary and wierd. If you'd like talk to someone about it, I'm more than happy to, even if it is just to vent. If not that's fine too. Your best bet for any and all info about ITP is at www.pdsa.org. It's the Platelet Disorder Support Association, they're worldwide and they have lots of resources, referals and sympathetic ears. Take care of yourself, and I like your art too!